Technological advances and safety concerns have driven developments in both line marking machines and marking liquids. The traditional system consisting of watered down lime applied by a transfer wheel box marker have been updated, and there are electrical spray markers using specially designed paints. Lime has been banned in some countries due to health risks e.g. infecting of cuts. At Pitch Supplies, we supply a wide range of marking machines and paints all designed to help achieve quality long lasting lines with minimum effort. 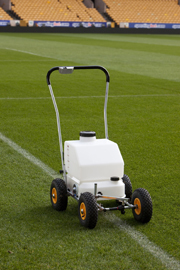 Electric spray line marking machine for applying line marking liquid to sport field surfaces. The TXE 353 Pro is the latest development of one of the world’s most popular line markers. It retains all the attributes of the original machine, including light weight and ease of use, but also incorporates a series of customer-driven design enhancements that improve its performance and make it even easier to operate and maintain. One tank marks up to 3 soccer pitches. The battery on this machine will last for up to 2 hours. 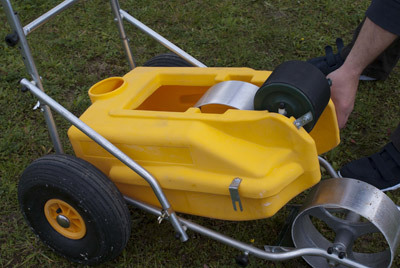 Optional attachments available are the Athletics marker, Spray Boom and Front Marker. The TXE 606, which has larger tyres, battery and a battery condition indicator, is suitable where multiple pitches are being marked. 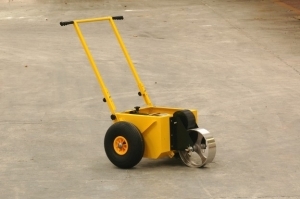 A completely re-designed and re-engineered transfer wheel line marker. 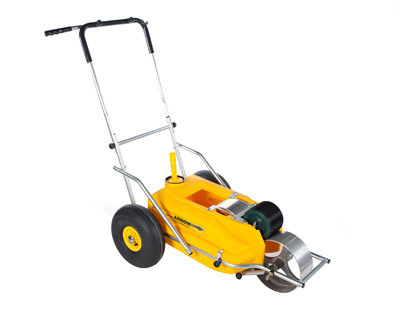 Lighter, tougher, more accurate, easier to use and to clean than previous transfer wheel markers, this all-new machine features a longer wheel base, better weight distribution and lower centre of gravity to help ensure lines are arrow straight, time after time. During the present economic climate, when budgets are being severely restricted, the ARROW is the perfect choice. With all its design innovations and improved materials, it actually costs less than predecessor machines yet deliver a host of advantages. Easy circle marking via inbuilt eyelet hook (enables twine from a centre post to be attached to machine in exactly the right position). Spot brush for penalty/centre spots and finishing lines incorporated in the machine. Spring-loaded and positively fixed central transfer wheel to ensure consistency of line. Facility to adjust transfer wheel to achieve require line definition. Once set, produces the same quality line time after time. New streamlined tank manufactured from ultra-strong moulded plastic. Holds enough to mark three standard football pitches. Unique tip-tank feature retain unused line marking liquid and make cleaning easier. Tank can be easily removed from frame for thorough cleaning. Frame manufactured from triple coated steel tube. No weak welded points that could corrode. Height adjustable handlebar with detachable ‘cow horn’ bar for greater control. Folds down for transport and storage. Light weight. More than 8kg lighter than previous models, making one man operation totally feasible. 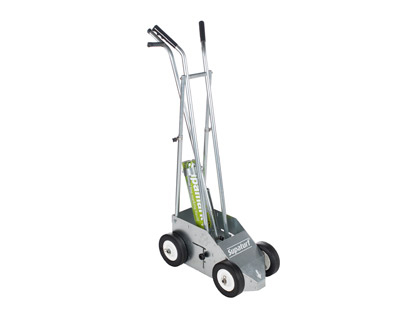 Tried and trusted by many groundsmen, the Supaturf Briteliner 400 box marker is still available to those who prefer traditional line marking methods. The all new Supamark Box Marker, designed for use with Supamark Aerosols, is the ideal applicator for marking hard surfaces of anything from tennis courts and indoor pitches to playgrounds and car parks. 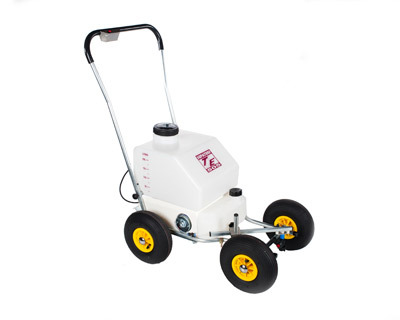 The new machine, has been re-designed to make the marking of hard surfaces using aerosol marking liquid easy, efficient and accurate. Four Wheels for greater stability. Fully Adjustable twin handles for precise control. Simple, push ‘on’/release ‘off’ spray control, operated by thumb pressure without letting go of the handles. Line widths fully adjustable via simple mechanism that raises/lowers the aerosol applicator. 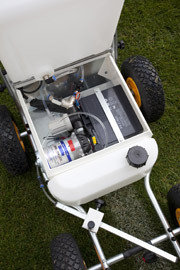 Designed to provide clear visibility of lines when spraying. Specially shaped front cone makes it easy to line up front guide.